Positioned as one of the White Isle’s leading five-star destination, from the owners of Marbella Club and Puente Romano, the hotel offers 152 leading designer rooms and suites, a spa by Six Senses, four restaurants and bars, and an incredibly skilful curation of indulgence and serenity in one of Ibiza’s chicest bays. Designed to be the ultimate playground for grownups, every element has been carefully considered to provide guests with the finest, authentic island experience. The resort itself is a masterclass in understated luxury – natural materials like marble, stone and rope are used against a cool palette of whites, golds and Ibizan blues and the entrance is a light-filled atrium that leads your gaze directly through to the ocean beyond. 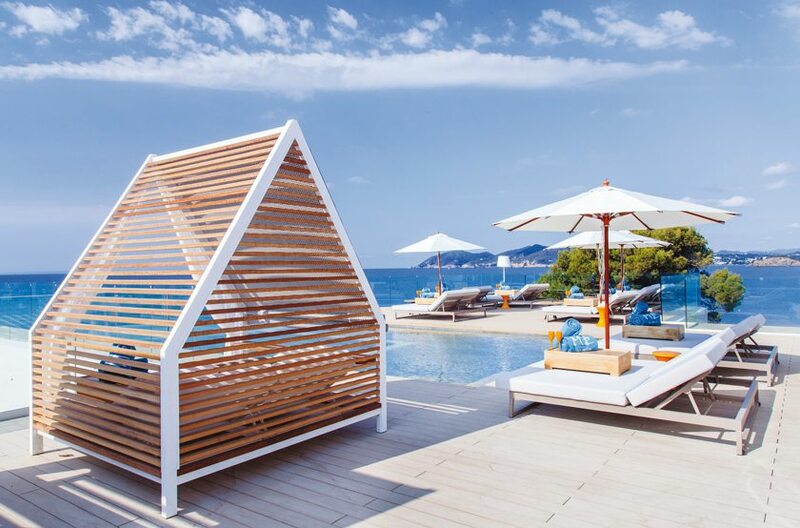 Read Sophie Ball’s full review of Nobu Hotel Ibiza Bay, here. More Travel: What’s on in Paris? Really, there’s only one way to travel to the White Isle. By private jet. 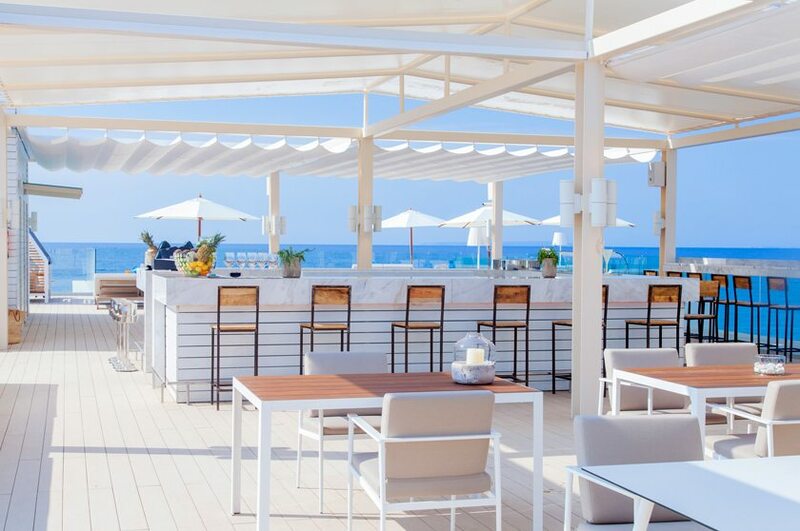 Bypass the diehard party crowd who head straight to Pacha from the airport to throw an all-nighter on the dancefloor and head instead to Santa Eulalia and the sparklingly white ME Ibiza for sundowners on the rooftop bar and a spot of supper. After all, no self-respecting partygoer would dream of turning up at a club before 2am. A relatively new 5 star boutique hotel, low-key sophistication is the name of the OD game. Located a block back from the iconic Talamanca beach, and just a 15-minute drive from Ibiza Airport, make use of their valet service for guests, if you arrive by hire car. Although, with a stylish sundeck featuring three pools, and a DJ playing from lunchtime ‘till dusk, there’s little need to move far during the day. 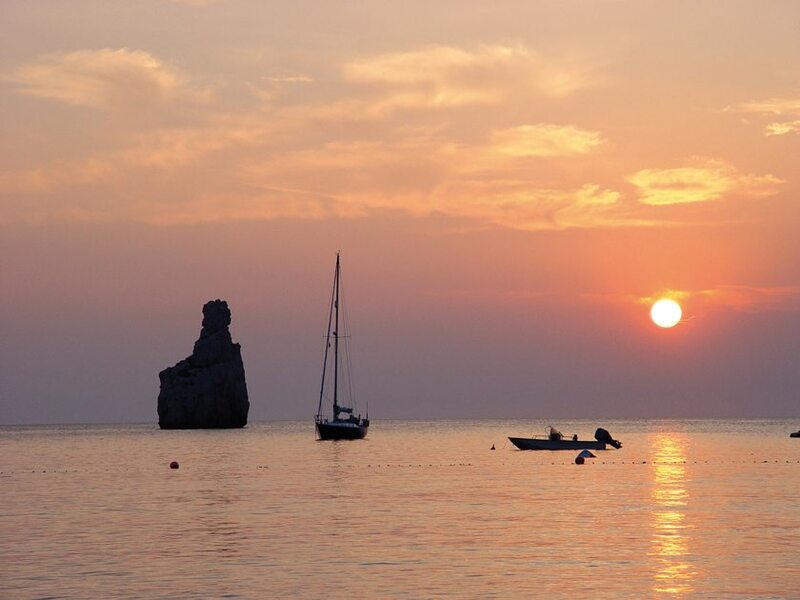 Not to mention the local beaches, and Ibiza’s legendary Fish Shack, being just a short walk away. Architecturally designed interiors feature narrow tongue and groove sustainable wood panelling, creating a Scandinavian look and feel of organic warmth. Iconic mid century pieces include Eames Bucket Chairs in the dining area. Where we took full advantage of the breakfast buffet – with everything from protein pancakes to eggs benedict on the extensive menu. All served ‘till noon, for those sleeping off a night on the party Isle. Rooms are mostly open plan, with well considered enclosed bathroom areas, allowing for a little…ahem, privacy. Our balcony overlooked those lounging poolside, with stunning vistas of the island’s most exclusive marina and Ibiza town twinking further afield. While another worthy mention goes to the complimentary soft drinks in the mini-bar. A rarity in Ibiza, where a bottle of water in hotels and clubs often costs 15 euros. Book your stay at od-hotels.com. Boutiques on the island are springing up faster than you can say ‘boho chic’. There are two sartorial vibes, so you need to choose your fashion tribe. Those from the Roberto Cavalli school of dressing – and, indeed, he has just opened his latest Cavalli Club near the marina – will be flaunting tight-fitting everything, sky-scraping shoes and excessively glam accessories, all packed and brought with you in your Louis Vuitton luggage. You can of course come to Ibiza and not party. The northern part of the island is far quieter (this is where Jade Jagger and Charlotte Tilbury prefer to be; read Jade’s guide to Ibiza, here) – and you can do some beautiful walks and enjoy gentle evenings at places like Paloma, which serves up terrific homemade grub in the middle of the island. From the team behind the widely renowned Amante Ibiza, comes sister restaurant Aiyanna. Located in Cala Nova Bay on the north side of the island, Aiyanna offers a modern take on Western Mediterranean food with meze sharing plates, free-range fish, organic meat and an array of vegetarian options. Continuing the tradition of the perennially popular Ibizan boho vibe, Aiyanna also offers 60 beach beds, a DJ and a daily wellness programme with morning Pilates and yoga sessions. Without a doubt, take ME’s boat, a blissful hour of seabreeze, to Formentera for a tranquil day at the beach. Pitch up just outside one of the coolest beachside restaurants you’d hope to find – Juan y Andrea – for piles of paella and cold cervezas. Muck about in the blue, blue sea and sunbathe on the white sand beach before gearing up for yet another night out back on Ibiza. So many of the beaches (we recommend Benirrás beach or Cala Salada) have the most amazing beach cafes, which offer the perfect antidote to the big clubs. Pre-trip, buy Hjordis Fogelberg Jensen’s new book My Ibiza, which includes things to do and places to see that even the locals don’t know about. Avoid visiting in high summer. The island’s character changes completely in the quieter months and you can even find a fair amount of sunshine in January and February – perfect for a yoga or detox retreat. 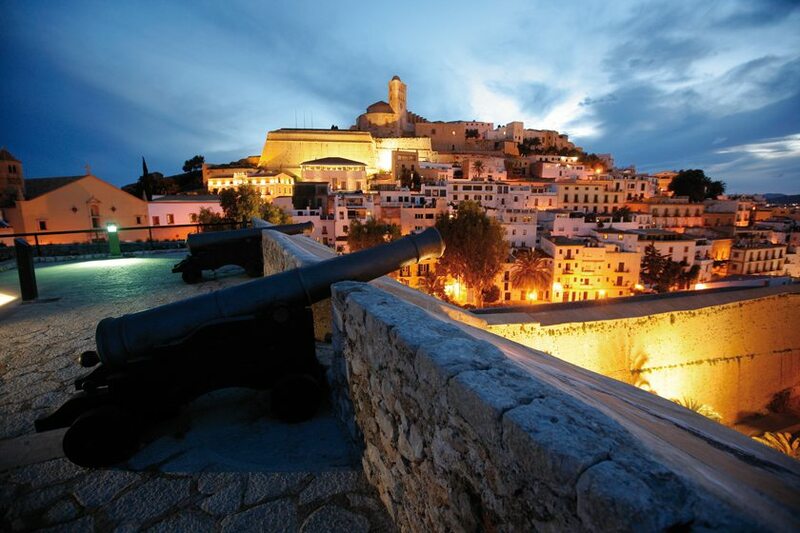 Ibiza Town is a UNESCO world heritage site and well worth a proper visit. If travelling commercial to Ibiza fills you with dread (we’ve all read those in-flight party headlines) then look no further than Surf Air, the world’s first all-you-can-fly membership airline which offers the benefits of private aviation for a fraction of the price. Founded in 2013 and well-established in the US, where it serves 17 destinations from hubs in California and Texas, the airline debuted its London-Ibiza route this summer with a further European roll out imminent.